Trust us – you’ll want to spend all day here. If your coming from Devon, start by taking one of the passenger ferries from Plymouth and discover an approach to Mount Edgcumbe by water. Mount Edgcumbe Country Park was the earliest landscaped park in Cornwall. Today it is made up of Grade I listed gardens and 55 Grade II listed structures. What’s more – all 865 acres are free for you to discover. 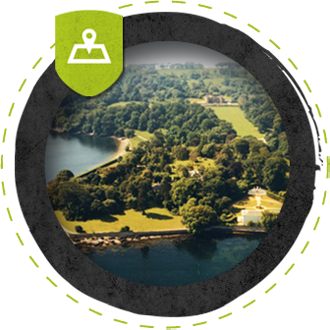 If your more adventurous visit during a festival weekend, head outdoors on a mission with Survival Wisdom, play a round of Disc Golf, hire a bike, explore the National Camellia Collection or take a guided tour of the former home of the Earls of Mount Edgcumbe. There are three places to enjoy excellent food and drink at Mount Edgcumbe Country Park. We also offer a selection of hot and cold drinks and snacks at the Adventure Segway outpost. Open daily 10.30am – 4.30pm. Homemade food locally sourced and prepared daily by creative chefs. Sunday roast, brunch, lunch, high tea, afternoon tea, cream teas, coffees and homemade cakes, Callestick Farm ice cream, beer, wine and beverages. Located in the beautiful formal gardens. Open daily 10.00am (9.00am on Saturday) – 4.00pm. An informal place for families, friends and locals to gather and enjoy. The menu focuses on homemade, freshly prepared and locally sourced breakfasts, light lunches, hot dishes, drinks, homemade cakes and scones. Located next to Adventure Segway. The Edgcumbe Arms is in the hamlet of Cremyll on the banks of the River Tamar. The full menu is served every day from 12.00pm and they serve breakfast, hot drinks and coffees from 10.00am daily. On Sundays the famous Carvery is served from 12.00pm until 8.30pm. We have toilet facilities at the Adventure Segway outpost for the use of all visitors. Alternative toilet facilities are located throughout the park. Unfortunately for safety you will not be permitted to use a camera or mobile phone whilst riding. Our instructors will be on hand to take loads of photos of your group. That way you can concentrate on having more fun. For just �6 (or �15 if you are a larger group) we’ll upload all the photos of you and your whole group for you to download when you return home. Some people arrive with everything for everything. That’s fine – if you need to store any personal belongings we have provided lockers (£1 non-refundable) which are available on a first-come-first-served basis. Adventure Segway will not take responsibility for any items left unattended at the Adventure Segway outpost. It is our policy to recommend that pregnant women do not participate in Adventure Segway as there are associated risks with any outdoor adventure activity. However, whether you decide to participate is entirely up to you. The more challenging parts of the session are entirely optional, which we would recommend you avoid minimising the risk of injury. 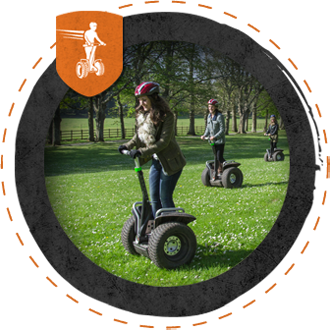 Due to the design of the Segway Personal Transporter and the nature of this experience, we can only accommodate visitors who are able to stand up without aid for up to 90 minutes. 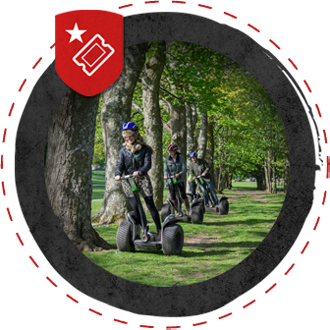 Mount Edgcumbe offers an all-terrain Tramper mobility scooter for hire which provides easy access to the paths and trails around the gardens and wider estate for people with disability. Call us on 0371 789 1024 and we’ll arrange to have this available for your use. The nearest EcoBus stop is at the Barrow Centre car park – directly opposite Adventure Segway. The Mount Edgcumbe EcoBus stops at various points around the country park Sunday – Thursday every 30 minutes from Easter – September.